If there are cards installed in the root of a central server, how many times does Aumakua trigger? Aumakua triggers once after the whole access step. Does Aumakua trigger after the Runner accesses Archives? Does Aumakua trigger if the Runner uses Eater during the run? Yes. Aumakua cares about the access step as a whole, not about accessing any specific card(s). Does Aumakua trigger when the Runner plays Drive By? Yes. Even if the exposed card is trashed by Drive By, Aumakua only checks if an accessed card is stolen or trashed, not an exposed card. Does Aumakua trigger if the Runner uses Salsette Slums but does not steal or trash any other cards accessed? Yes. The Runner accessed cards and did not steal or trash any of them. Aumakua is everything you really wanted Darwin to be. A threat card. A lot of the time, you won't really be using Aumakua at all. Instead, it will accumulate counters as you go about business as usual, and it does so in excellent combination with cards like The Turning Wheel, Aeneas Informant, and of course Maw. The Corp cannot afford to ignore the virus counters stacking up on Aumakua. Once the stack reaches 5 or 6 counters, big ICE becomes paper thin - here the 1 per sub (versus 2 on Darwin) is absolutely crucial. If the Corp doesn't do something about it, then your big turtle will be running anywhere it pleases. The forced Corp response often looks like an entire turn lost to purging viruses, a cost which can be extracted multiple times as simply running like normal will pump your turtle right back up. Combo with Fester to make this tax exceptionally hard for the Corp.
And in a pinch, you can always hit any unprotected server (including Archives!) for extra counters on Aumakua. A silver bullet for the scoring remote. Criminals excel at finding one-time ways into servers. Whether it's a fraud breaker or simply an Inside Job, a Criminal runner knows how to get in just about anywhere when the price is right. When combined with backup in form of Dean Lister, Aumakua can steamroll past just about any ICE in your way, to swoop into a scoring remote and swipe a marked agenda. One of the most attractive things about Aumakua is that, at 1 influence, it can bring this Criminal flavor into any other faction for very little cost (its best friend Dean Lister isn't even a Criminal card at all). Therefore, you can get all the benefits above in a more virus-focused Anarch deck as well as in a Criminal build (the Shapers already have a lot of fancy program tricks in-faction). 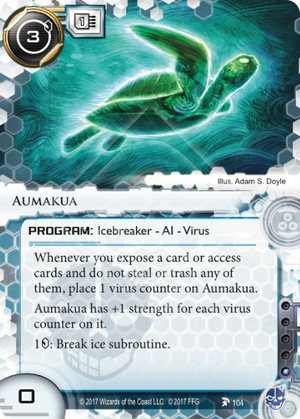 Also useful for cleaning up weak ICE before you can get your whole rig out, Aumakua is a solid addition to any icebreaker suite, taxing the Corp and being the sort of jack-of-all-trades that makes Atman fun, albeit with a very different style. Another addition to the time-honored Snitch - Au Revoir - Reflection engine, at least until the first two rotate out. Expose is a niche mechanic not often used, so it's nice to see something that can take advantage of that. Similarities can be drawn with Darwin as a relatively cheap, versatile AI that can gain momentum very quickly, but this virtual turtle can gain up to 4 virus counters a turn (more if you import shenanigans like Incubator or Surge.) In addition, Aumakua is 1 to break as opposed to Darwin's 2, making it much more affordable to use. It's also 1 influence, so importing to Anarch isn't a losing proposition. As mentioned, Aumakua works well hand in hand with Snitch or other expose cards, like Infiltration, Deuces Wild or (not) Raymond Flint. Criminals have a laundry list of expose cards - that is to say, most of the expose cards available - and Aumakua benefits on top of all of those. Silhouette: Stealth Operative is a good fit for our turtley friend, as her ability gives natural exposes along with her runs. However, exposing is not the only thing Aumakua gains virus counters from. Accessing cards and not stealing or trashing them gives our virtual turtle valuable strength. This means that you gain that counter even if the card you access can't be stolen or trashed. Non-trashable operations and ICE? Virus counter. Trashable operations and ICE? Hey, if you don't want to pay, then virus counter. Put an agenda on Film Critic after accessing it? Virus counter. Asset spam? It's raining virus counters. The ease with which you can put counters on Aumakua - especially in superwide asset spam decks - is its greatest strength against the Corp's best defence: purging. The way Aumakua works means you can easily recover tempo if your deck is prepared to help it out. Keep expose cards ready to give it the boost it needs. Keep a killer on hand for Swordsman, if anyone even uses that anymore. Keep a decoder, too - I suggest Abagnale - for Turing, but I only say that because I specifically nearly lost a game to Sir Alan. Unless you're teching specifically against it I would save on deck space, though. In conclusion, Aumakua is a cool virtual turtle that takes Darwin's strength mechanic and updates it for a new age and a new faction. It has good synergies both in- and cross-faction, and if you're not afraid of AI hate definitely give it a try in your expose-based Criminal decks. Alternatively, have a go at bringing it into Anarch as a low-costed and low-influence AI that benefits a lot from virus-based strategies.